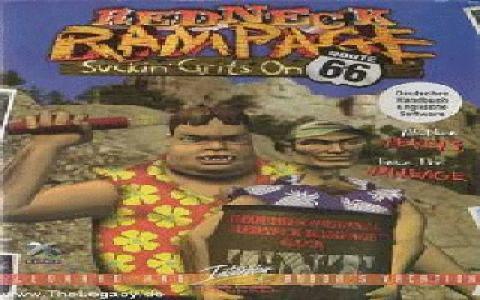 Redneck Rampage: Suckin' Grits is a 12 level expansion pack for the original 1997 hit game published by Interplay called "Redneck Rampage". Redneck Rampage: Suckin Grits extra 12 levels, consist of the many tourist locations that Redneck hillbillies in the USA like to frequently visit. Redneck rampage is a hilarious game, that aims to offend. The game reminds me of early episodes of South Park, in it's over the top offensive humor and violence. The expansion pack basically starts at exactly the same spot where it's predecessor game left off. Unfortunately the expansion pack does not have the same hilarious, hit hillbilly soundtrack as the previous game did, so sadly most of the expansion pack will be played in silence. This is a pretty violent game, you can basically shoot everything in this game eg. chickens, cows, your neighbors, aliens etc. which can actually be quite entertaining. That is the very reason this games title "redneck rampage" is very suitable, because you are a redneck going on a mass killing rampage, once you discover aliens have taken over your local town. Hilarious concept. The gameplay can be a bit frustrating. 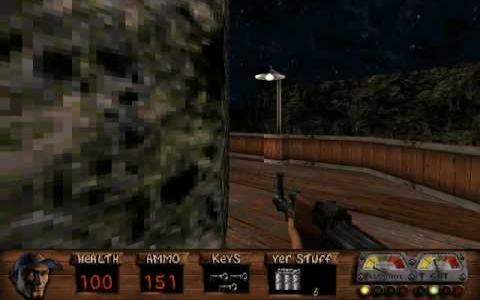 The gaming engine's used in the game is the exact same engine's used for more well known game title Duke Nukem 3D. This is one of those games, you would put on for half an hour to show a friend when he comes around, to have a good laugh before it quickly gets boring. It is well worth a look even if it just for a good laugh, if you like offensive humor. If you are easily offended by violence, or are a Southerner in heritage and don't find crude offensive humor funny stay away from this game.